CAN WE FORGET THAT THE U.S. IS THE ONLY NATION TO HAVE USED NUCLEAR WEAPONS? 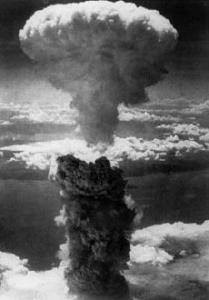 Hiroshima, an estimated 80,000 people were killed in a split second. least another 70,000 people had died from radiation and injuries. carried out the two worst terror acts in human history. Washington's war-time ally] rather than end the Second World War''. Kuznick studied the diplomatic archives of the US, Japan and the USSR. the war'', Selden told the New Scientist. ruthless preparedness to use it. demonstration of the bomb may impress Russia''. ordinary people around the world. terror in Afghanistan and Iraq. This article stress that: A) Japan was ready to surrender, B) the bombs were used as a demonstration of U.S. power for the Soviet Union. The below commentary misses 4 things: 1) The oft repeated in U.S. history books and history programming that there would be the loss of 100s of thousands of U.S. soldiers if Japan was invaded is incorrect. 2) Japan had approached the King of Sweden for to notify the U.S. that they were ready to negotiate. 3) U.S. wanted an unconditional surrender which would allow U.S. corporations to open up Japanese markets. 4) Russia was about to enter the war against Japan now that German was defeated, and the U.S. didn’t want Russia to be part of the repartition of the orient.